My question is, is there a way to install IIS on a windows 7 box to use .NET 4.0 (MVC 3) without taking this extra step? The accepted answer is correct, however sometimes you would get the "Aspnet_regiis.exe is not recognized as an internal or external command, operable program or batch file." error message. Make sure that your .NET 4.0 installation is not corrupted (run the installer and 'Repair' it). There's also a chance it is not installed on your machine at all. If you see the message "Aspnet_regiis.exe is not recognized as an internal or external command, operable program or batch file. ", switch to the C:\Windows\Microsoft.NET\Framework64\v2.0.50727\Aspnet_regiis.exe -i at the command prompt. I found the articles to fix this issue by simply run the following commands at the command prompt. C:\Windows\Microsoft.NET\Framework64\v4.0.30319>aspnet_regiis.exe -i Microsoft (R) ASP.NET RegIIS version 4.0.30319.33440 Administration utility to install and uninstall ASP.NET on the local machine. Copyright (C) Microsoft Corporation. All rights reserved. Start installing ASP.NET (4.0.30319.33440). This option is not supported on this version of the operating system. Administr ators should instead install/uninstall ASP.NET 4.5 with IIS8 using the "Turn Win dows Features On/Off" dialog, the Server Manager management tool, or the dism.e xe command line tool. For more details please see http://go.microsoft.com/fwlin k/?LinkID=216771. Finished installing ASP.NET (4.0.30319.33440). To fix this on a Windows 8.1 I would suggest to do the following thing. If you want to deploy an MVC application without installing MVC, you can deploy the MVC DLL's with your application. This gets around installing MVC 3. You can use features in some .Net 4.0 namespaces without installing .Net using a similar approach. I added the ISAPI/CGI paths for .Net 4. Which didn't fix the issue. So I then ran a repair on the .Net V4 (Client and Extended) installation. Which asked for a reboot. This fixed it for me. To fix this on a Windows 8.1 Professional machine do the following. In Web Platform Installer install ASP.NET 4.5 (This feature has one dependency). I had a similar issue with Windows server 2012, installing the feature "Application Server" in the server manager fixed the issue. 500.21 will occur on the first user connection only. Subsequent connections work. Resolved by correcting the applicationInitialization url collection on the .NET website. And when I removed my handler from [system.webServer] my problem disappeared. in some scenario this error occurs because the Microsoft .NET Framework 4.0 configuration for ASP .NET has been damaged, which can occur if Microsoft Visual Studio 2012 was installed before Visual Studio 2010 or Microsoft SQL Server 2008. After trying different things i reached the conclusion, repair you .Net installation by running following command. For more information follow the link. I was having this issue on one of my webservers when trying to switch an apppool from classic to integrated. It worked fine on two of my other webservers, not just this one. It's Server 2012, so you can't do the aspnet_regiis and there was no setupcache folder to try that repair. Everything was set correctly under features. Once I added them, everything worked great. Not the answer you're looking for? Browse other questions tagged asp.net-mvc iis-7 configuration asp.net-4.0 or ask your own question. 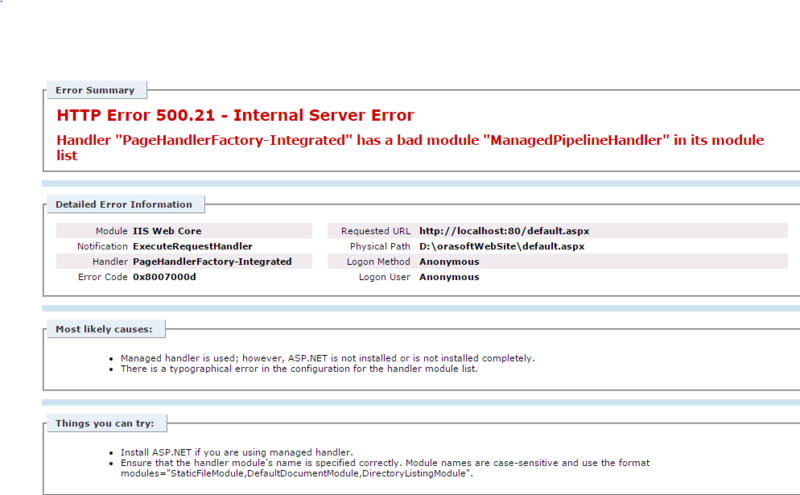 ASP.NET Web Application gives HTTP Error 500.21 - Internal Server Error.